Touch is a sense that is frequently overlooked in academic research, and indeed, in our daily lives. We tend to think primarily in visual terms and then audio, whereas our other sense are relegated in our understandings. However, touch is brought to the fore in different religious-spiritual context. Humans seem to have an innate desire to touch important objects (that’s why so many museums, exhibitions and shops have signs expressing their displeasure at such!). In touching something we feel closer to it – it is intimate act. With religious, spiritual or supernatural objects by touching it we get closer to the origin of their significance. 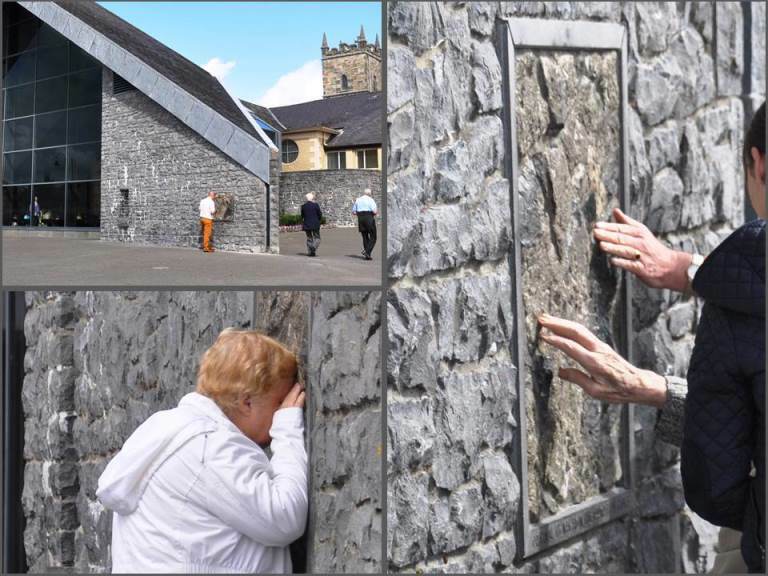 Pilgrims visiting Knock, a Marion Shrine in Mayo, often touch a section of wall at the corner of the Apparition Chapel. It is believe that in 1879 the Blessed Virgin Mary appeared at the gable end of the parish church, along with St Joseph, St John (the Evangelist) and Jesus Christ as the Lamb of God. The stones of that section of wall are from the end of church where the apparition occurred. Some pilgrims briefly touch the wall in passing, others keep their hands there focused on feeling the stone, and others, as seen above, rest their faces against the spot. In the more purposeful and concentrated touches the prayers are made physical. The intentions and well-wishes are channelled into that touch.